And what's your favorite historic part of London? It's time for high tea! What are you having? Um, do you actually drink tea? When will you wear the Crown Jewels? BONUS! Would you play cricket, polo, or croquet as a royal? You're the oldest sibling in your family, or the leader of your group. You're there to enforce rules, and to uphold the standards your family has set before you. Just don't be too boring, okay? You're Princess Shinylocks, ahem, Kate Middleton! 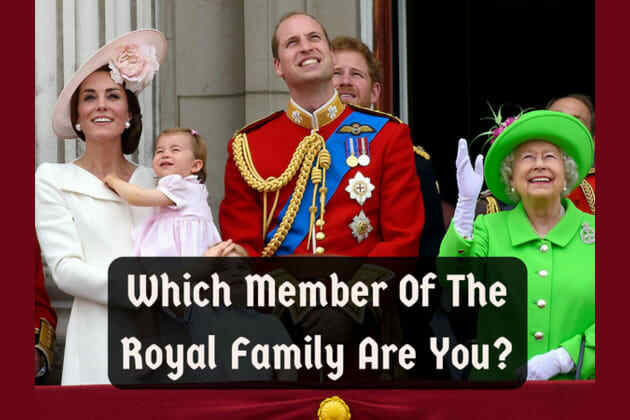 You know what you signed up for in the royal family, and you'll carry out your duties with never a hair out of place, and a smile always on your face. Isn't being perfect like, so hard? You're the OG, the one ruler who rules them all! You're the kind of person who spares emotion wherever possible, and you're not willing to go above and beyond your job description. You're such an iconoclast! As the newest (and American!) addition to the royal family, you've got your work cut out for you. You want to shake things up and breathe life into centuries of monarchy, but don't move too fast, okay?? Slow and steady wins this race.